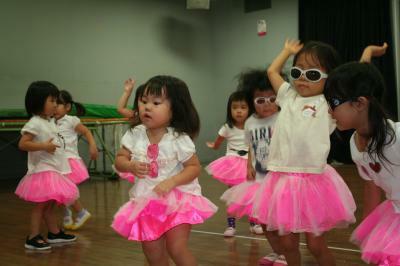 Today we had a dress rehearsal for our sports day dances! This weekend we have our sports day! Today we practiced a lot of things, our foot race, dances, Tamaire, bread eating, and others… All our activities are so much fun! 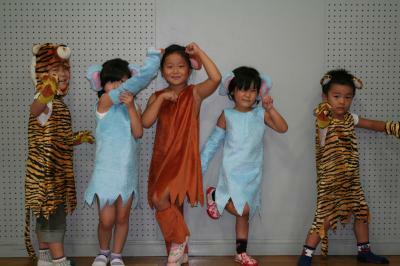 Today we practiced very hard for our up coming sports day. To make our practice more fun, our teachers gave us popsicles! We are looking forward to our parents seeing us do our best on sports day! Friday is show and tell day. For today’s show and tell, showed photos and talked about places we went on our summer vacation.It’s fun hearing about what our friends did during their summer vacation! Our “all about me” theme includes our families! Today we finished our posters by adding pictures of our mommies, daddies, sisters, brothers, grandmas and grandpas. It’s fun telling others about our families, and listening to our friends family stories. Health is very important at Apple Bee. 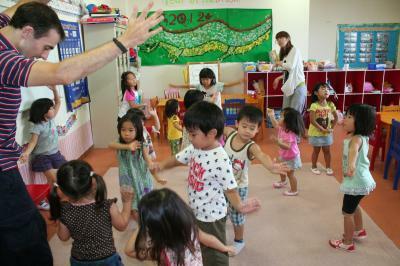 To help us keep healthy, we try to do stretches every day. 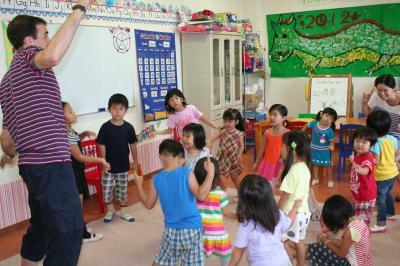 Stretching is important to keep our bodies limber, and helps maintain our posture.Everyone should stretch everyday! 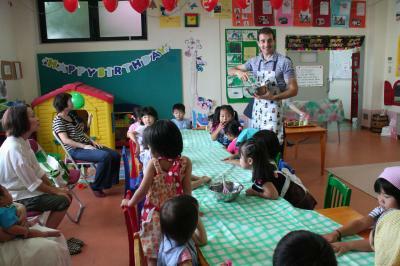 Today we had a birthday party for our students who were born in August and September. 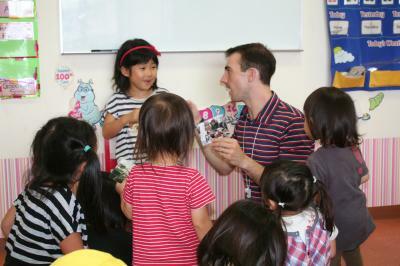 We looked at our birthday children’s baby pictures, heard baby stories from their mothers, sang songs, and played games.We made Dorayaki too. They were yummy! This month’s theme is “All About Me.” Today we drew our faces and filled out our profiles on a worksheet. We will soon make a poster with information about ourselves and our families.We like all about me! 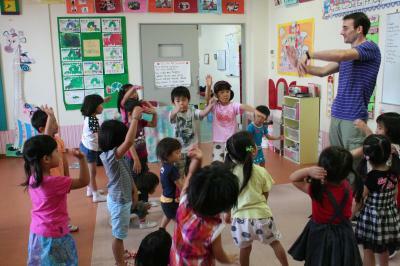 Today we practiced another dance we will be doing on sports day, “The Chicken Dance.” It’s fun and we love it! This dance popular at wedding parties in the US. 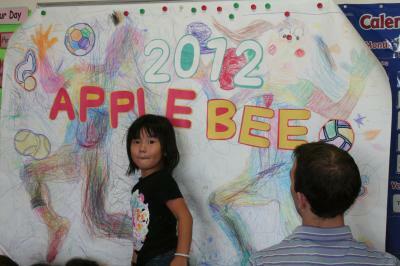 An important part of Apple Bee learning is how to interact with our peers, friends, and family. No matter how considerate we are of each other, problems do arise. We discuss friendship skills in order to help us get along better.Good friendship skills are very important for a happy life! Today we finished our sports day sign. We can’t wait to display it for out parents on sports day! Today we body rocked! To body rock, you must dance and move parts of your body.Can you body rock? 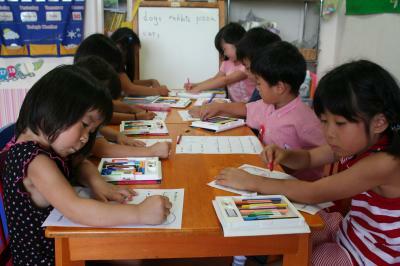 Today is workbook day and we did some work in our workbooks.